Looking for your Australian ancestry in the 1800's? 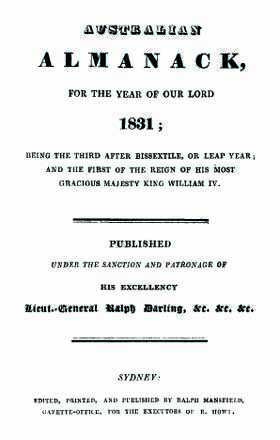 The 1831 edition of the Australian Almanac published by Ralph Mansfield was at the time the largest of its kind. It is titled Australian, but it is primarily about New South Wales and is divided into various sections: Calendar and Public Days; Local Laws and Regulations; Miscellaneous Local Information; Australian Agriculture, Horticulture &c.; General Information; European Governments; Colonial Civil Establishment; Military Establishment; Public Institutions; Shipping; and an Appendix which gives advice to new emigrants to the Colony. As genealogists we like finding out the names and dates of family members, but don't dismiss the social history aspect of it. Historians in other fields would already know that understanding the era gives us a far better perspective of just what life was like for our ancestors. This guide provides a wonderful record of life as it was in New South Wales in 1831. The Australian Almanac 1833 (O'Shaugnessey) was one that almost never come to fruition. This was due to lack of machinery to do the printing of the printers regular work, let alone the Almanac on top of it. But thankfully it was published, and now we have a great record of life as it was in New South Wales in 1833. It is titled Australian, but it is about New South Wales and is divided into various sections: Calendar, Public Days; Australian Agriculture, Horticulture &c., Supreme Court, Court of Requests; Miscellaneous Local Information &c., Civil Establishment of the Colony; Military Establishment; Public Institutions; and Shipping.So with this publication, which really is a reference book for the year, you can find the answer to many questions. Published by Cox & Co. it is titled 'Australian', but it is primarily about New South Wales, and is divided into two sections, the first containing information from England on the royal family, the government, the army, Europe, the USA and more. The second section contains information on government directories, laws, ecclesiastical, banks, medical board and medical practitioners, military establishments, ecclesiastical establishments, as well as religious and charitable institutions, schools, and miscellaneous companies from the colony of New South Wales. It also includes information on acts, postage rates and numerous statistics. Published by James W. Waugh, this Almanac is titled 'Australian', but it is primarily about New South Wales, and is divided into several sections, the first section (the Almanac) contains miscellaneous information such as a calendar for the year, which includes gardening information as well as moon phases. The section titled "Australian Topography" gives information on on the early explorers of Australia, which the "Acts & Ordinances" gives details of all Acts etc that were passed in Parliament during 1859 and 1860. This is followed by 18 pages of "Notes of Cases' thats were decided in the Supreme Court of New South Wales. The dates for the cases range from 1859-1860. The second section is the "Government" section. Listed first here is details of the English royal family, the government, the army, this is followed by details of the Australian colonies together with their governments, the executive and legislative departments, and the law departments of New South Wales. Part three is the most interesting, as it contains details on the companies of the time, together with details of those who headed them up. There are details on Insurance and Banking companies, Public Institutions and Societies, the Commercial Register, Steam Navigation Companies, city and suburban local government, military establishment, Masonic Lodges, Police Districts, Peninsular and Oriental Mail and Post Offices. The last section, but no less useful, contains 60 pages of advertisements for local businesses. These volumes contain information on government departments, laws, banks, medical practitioners, military and ecclesiastical establishments, as well as religious, educational and charitable institutions and miscellaneous companies from the colony of New South Wales.